Other stuff that keeps me happy. 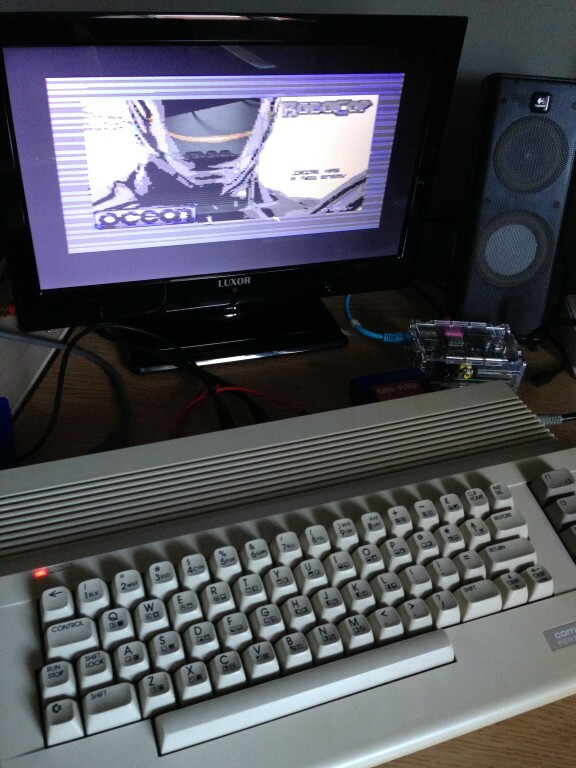 With my new (old) Commodore 64 setup on the desk, I’ve been enjoying a weekend of retro goodness and with thoughts of the new Robocop movie trailers still buzzing around in my head, it wasn’t long afterwards that thoughts drifted to the original C64 game. 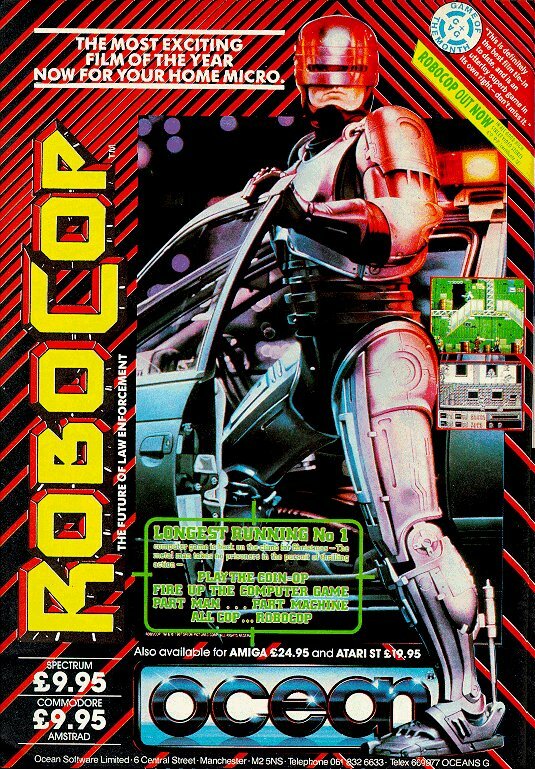 It might have been multi-load hell (on tape that is) but to my mind it’s the best movie tie-in that Ocean software ever did…..as well as Batman on the Amiga of course…..and The Untouchables wasn’t too bad either. 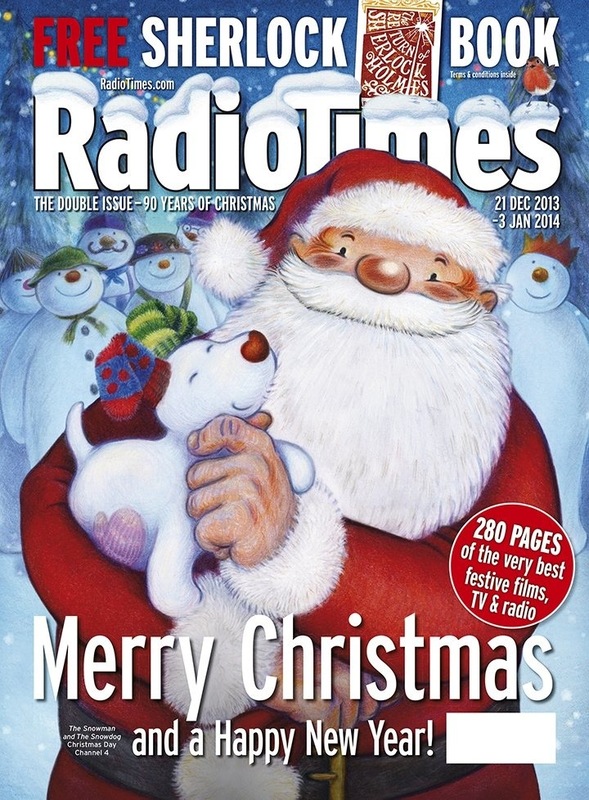 it contains that famous loader picture of Officer Murphy not looking so minty new. 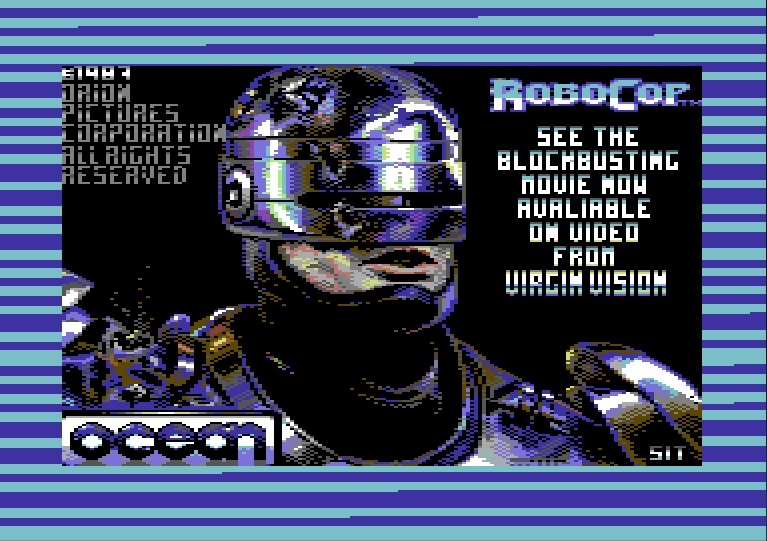 It was whilst the game was loading did an idea begin to form to have a little fun with Photoshop and create a new loader image based on the Robocop 2014 film and then have it display on the C64. 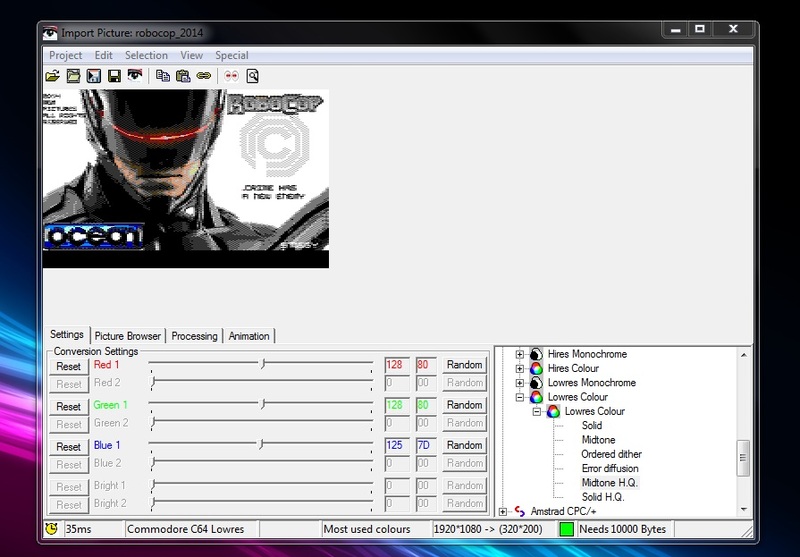 Retro-X has two modes for the C64 – High and Low Res. Sadly, no matter what I do, if I select High Res, the application crashes 😦 At first, I though it was because I was using Windows 7 but even trying with compatibility modes and running the app under Microsoft Virtual PC and VM images of Windows XP and Window 98 still shows the same error. If anyone else can get this to work, could you let me know how please? Dammit….well at least it didn’t virtual bsod. Low res it is for the time being then and I find that the Midtone H.Q setting and a little tweaking with the RGB sliders seems to give pretty good results. 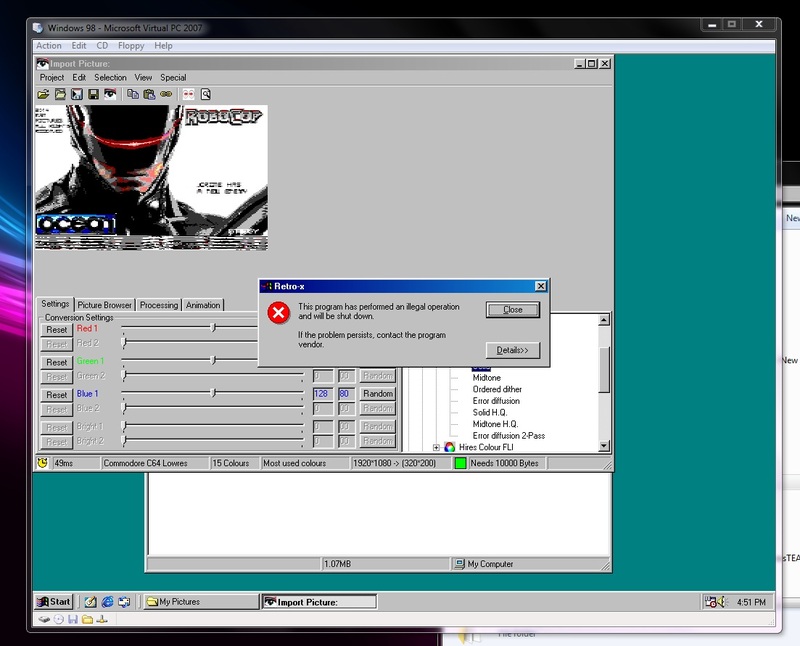 It’s also worth noting that there’s no need to resize the image prior to loading in Retro-X. Once done, you can save the output as either jpg, png or bmp but as I want to load this on my Commodore c64, I’ve chosen the old Koala format. 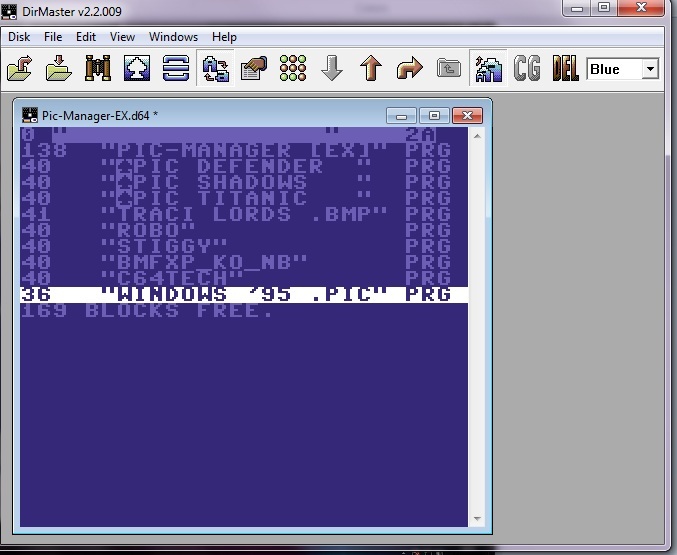 To view the image, on the C64 I’ll be using two pieces of software. I’m sure there’s probably easier ways of doing this but I found that, as I use both of these programs for other things, I’m kinda used to using them. It’s very easy to use once you know your way around the interface and there’s also a few example pictures included too – WARNING, a couple of these are pornographic so use with caution – your C64 might melt! 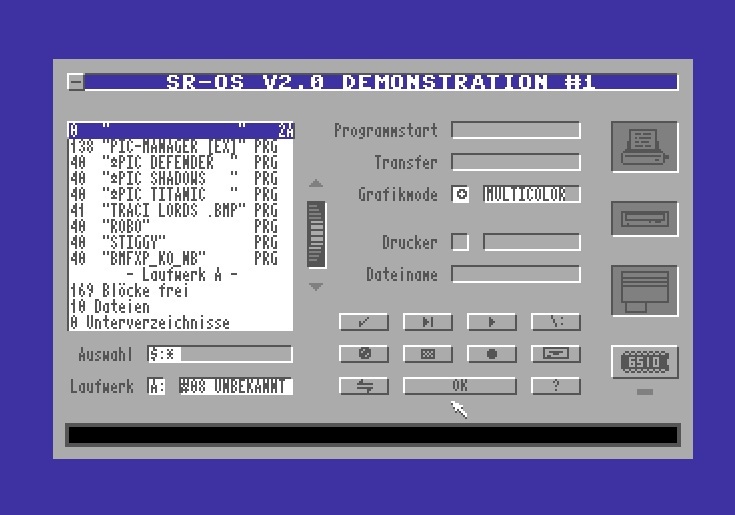 You will see a list of the program files contained within Pic-Manager EX .d64 file including all of the example pictures. All you need to do to add your own Koala image is simply drag it into the disk menu. Save the amended disk image which can be loaded on a Commodore 64 emulator or on the real thing after copying the image to a suitable device. I’ll be using my SD2IEC. 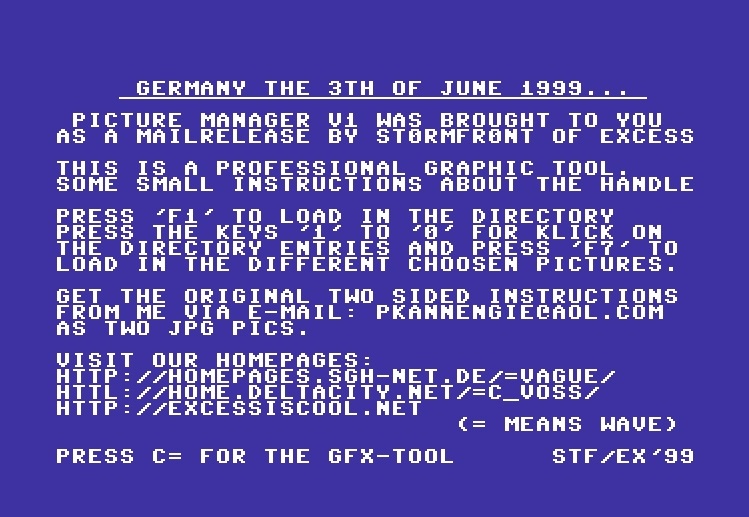 Load PIC-Manager EX and press the C= key to continue after reading the instructions if you wish. Press F1 to load the image list from the disk. To view an image, you need to select it first. You can either select a single image or load multiple images to play back as a slideshow. To select an image, press any number key from 3 to 0, 3 being the first image file as 1 and 2 are the actual program files. e.g. 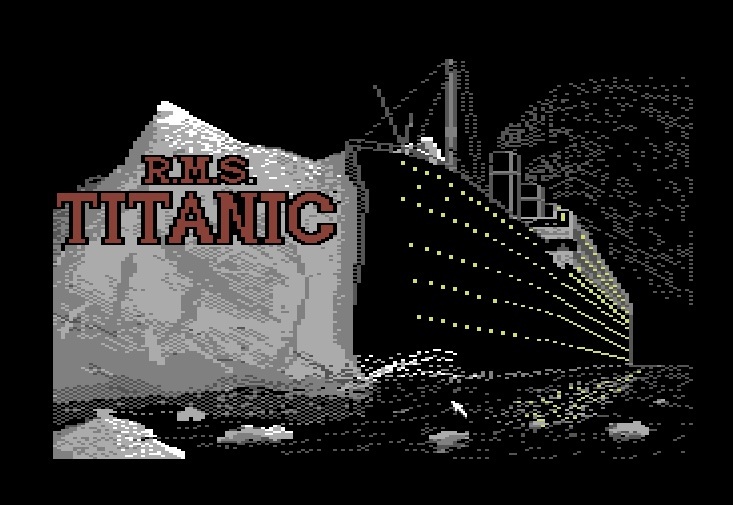 if I wanted to select the image ‘PIC Titanic’, I’d press the number 4 key. Selected images will have a tick icon appear next to them. To start the show, press F7. Woo, the internet sure is full of interesting bits and bobs tonight. My eyes on stalks, jaw somewhere flapping around my knees at all this geek candy. 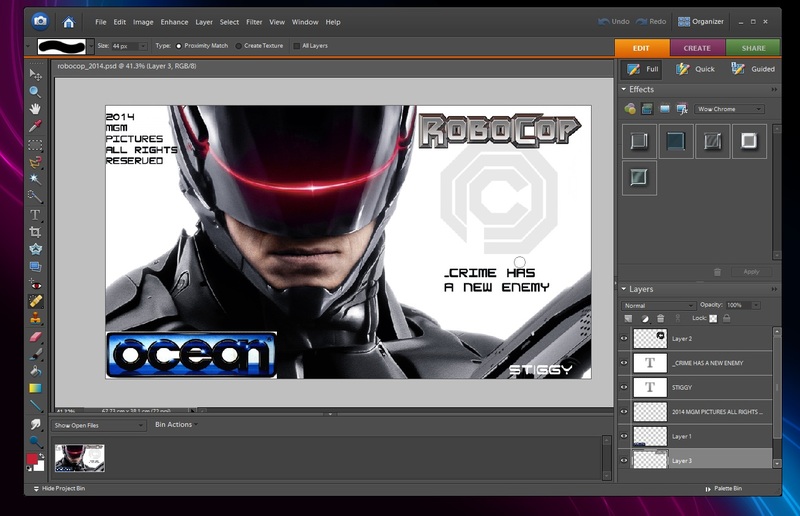 First up is a look at the new trailer (#2) for the 2014 Robocop film. I’m praying they don’t stuff this reboot up. 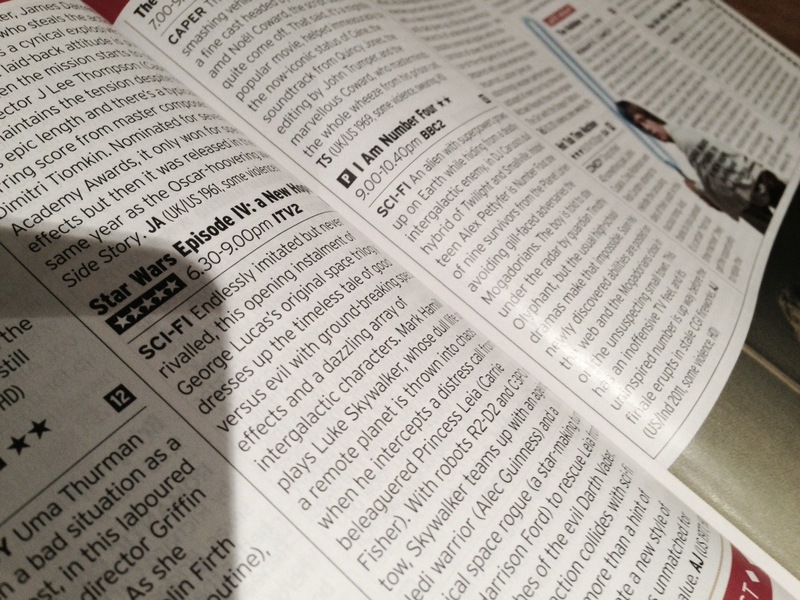 Noted in this months Retro Gamer Magazine newsletter – Sega’s Master System mascot Alex Kidd comes to back to our screens on a most unlikely platform. Yup, the ZX Spectrum. It’s courtesy of a fan made (free) homebrew release and I for one and so looking forward to playing this this weekend. Rubber key colour clash-tastic awesome-ness! One of the landline telephone sets we have in our house is an old (and extremely heavy) Bell RTT from the 1950’s which we had converted for use with the current exchange. 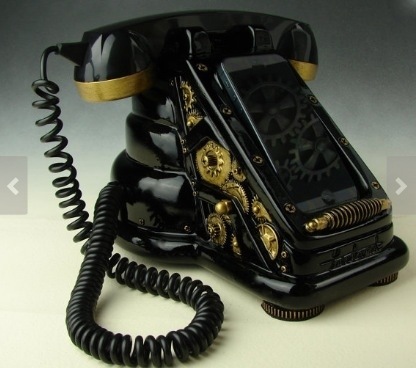 Its a nice period piece that’s both functional (although dialling each individual number is a very slow process) and fits in with the 1920/30 decor we both favour in our hallway. How about something a little more functional but retaining a vintage style? And finally, how about a downloadable Mortal Kombat style 2D fighting game where combatants are monsters and villains of classic 80’s and 90’s horror movies? All hail the Internet, so say we all. Wishing you a great gruesome Halloween. Classic B movie fun with The Creature From The Black Lagoon…..because everyone loves a wobbly monster! 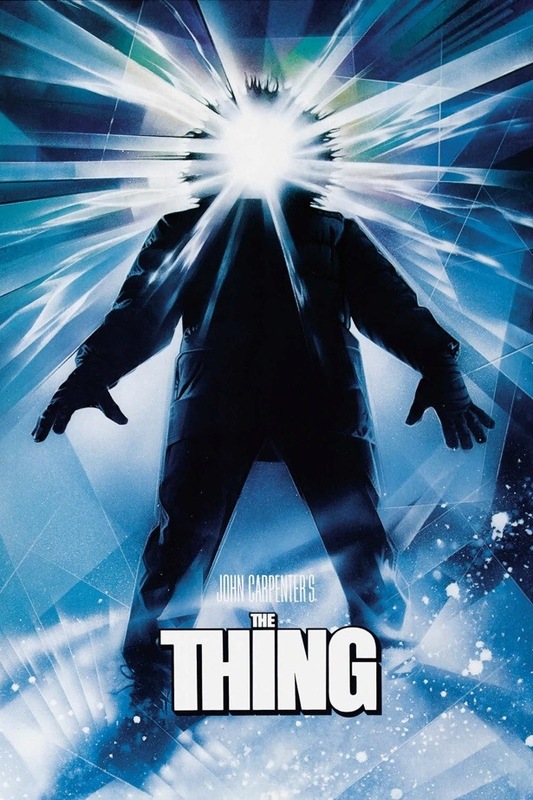 Followed by John Carpenter’s cult classic – The Thing…..because everyone loves a wobbly monster! 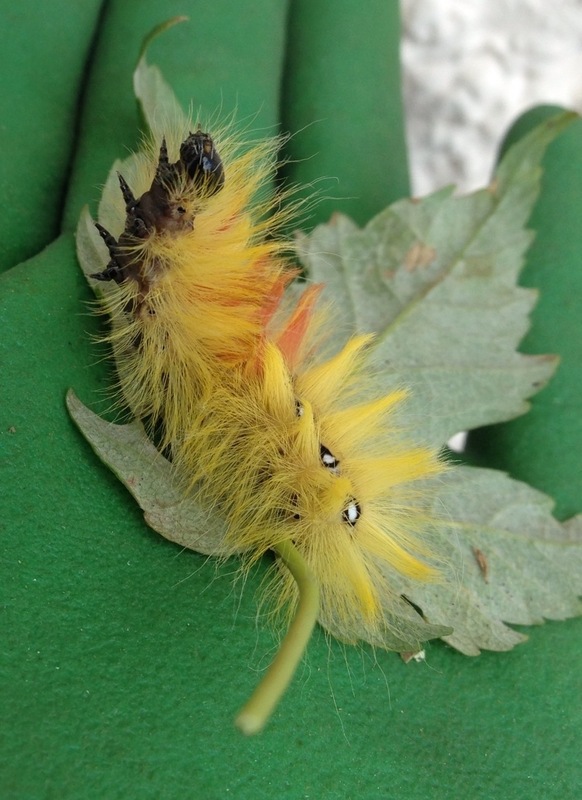 I spent a few hours on this very sunny morning doing a few jobs around the garden and whilst sifting through and shredding the trimmings from one of the trees I’d been pruning (I’m trying to keep the right ratio between brown and green material in the composer), something caught my eye. 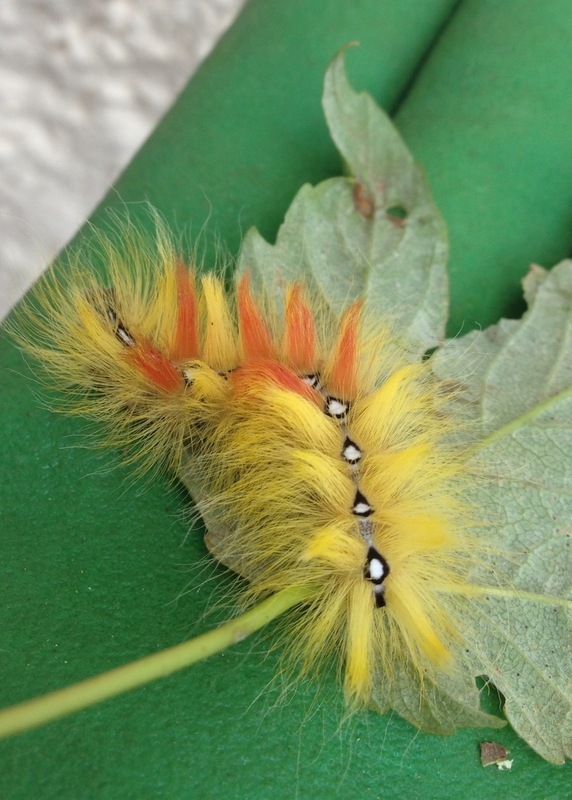 Handsome fella isn’t he….the internet says its from the sycamore moth.